Tyre in Warm Intrigues, wants to fly again. He is a young widower who has lost in love before but is now willing to take another chance on love. When he meets Phoenix, all systems seem to go. Everything feels right and he is wants to see if he can have a successful and fulfilling relationship. Phoenix is smart, perky and he enjoys her company. They have a lot in common and she is able to meet him at his own level, intellectually. Tyre experiences new and uncomfortable feelings as he falls deeper in love with Phoenix. He wonders where things are headed. ‘The questions bombarded him, and his insecurities were remembered that in earlier years he would have disappeared or switched up and dated someone else. But after Flora, he realized that he wanted someone permanent in his life. The dating game was just too costly. So he would talk with Phoenix and see if she would be honest about her intentions. Was it just a fling? Was he just someone to wine and dine her? Was he simply someone to help get back out there in the field? He did not want to be headed in one direction while she was headed another. The thought of passing her on to another man was more than he could bear to think about at the moment. He knew he had to slow himself down and keep his cool. He did not know if he could take a rejection from her, but he had to thicken his skin. Eventually, Tyre begins to feel more confident as the relationship grows. Their obvious compatibility lifts him above his own insecurities. She is so ‘easy to love’ and this helps him exude more assertive feelings. He sees her as someone who he would like to include in his future and he privately observes her. They laughed and talked, and she walked as she spoke strongly on some of her views on varied topics. He could see that this was a person who he strong opinions and that compromise was inevitable for them. His eyes followed as she pranced around the room and delivered her thoughts. “Love it,” he thought. Will Phoenix be the one to give Tyre his wings back? 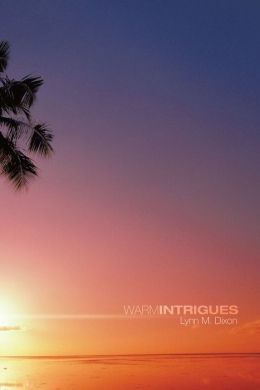 Read Warm Intrigues and see! We may feel uncertain when asked to use skills that have been lying dormant and doubt ourselves, as in the quote from Peter Pan. When we pull out those skills, dust them off and put them to use, we wonder if we still have it. Will we be able to excel and showcase our talents? Phoenix, in my novella, A Golden Leaf in Time Revised, embarks upon a librarian position in another state. Her wings have been tattered and torn from a former embattled job. She had to go into warrior mode more often than she liked. It had been unsettling and had definitely taken its toll on her. Her coworkers schemed and tried to make her look incompetent due to professional envy. The barrage of onslaughts exhausted her but did not totally break her spirit. When it had become unbearable, she chose the flight plan, rather than sticking around for more fights. She moved on to a new setting. As in the above quote, there were moments when she felt that she would never be able to fly again. Her heart was still heavy and she felt as if she was carrying the weight of the world on her shoulders. She questioned herself as she wondered if she would ever have enough enthusiasm or zeal to lift her confidence and help her to soar, professionally. To her delight, she lands a new job after arriving to her new location. It was a library again, but it was a far cry from the place where she had met her Waterloo. The former job was located in an impoverished area where many of its residents’ dreams had been broken and they were filled with hopelessness. It was in an old part of the town which seemed to be virtually forgotten by the rest of the city. But this job was in a wealthy suburb of a metropolis. The library structure itself was new and it was both beautiful and comfortable. There was abundance all around. She was inspired and chose to give it her absolute best. Others noticed her efforts. Phoenix felt buoyant and filled with hope. She knew that she did still have it, and that she was truly flying again! Many writers dream of having their works made into movies. Though movies rarely rival the actual book, it is still a huge honor if Hollywood takes on their creative project. After characters and settings have been chosen, there has to be the perfect music to set the tone for each scene. I will never forget Roberta Flack singing ‘The First Time Ever I Saw Your Face’ in an old movie called Play Misty for Me. Clint Eastwood was walking along with his girlfriend and that song along with the scenes of a waterfront will be forever etched in my mind. It was such a moving piece for the innocence of the moment. I recently pinned four songs to scenes from both of my novels, A Golden Leaf in Time Revised and Warm Intrigues on my blog. When I pinned Louis Armstrong’s version of ‘You Will Never Walk Alone’ to a scene from Golden Leaf, it made one of my commenters say that she needed to go back and re-read the book. After we have written the books, trying to market them is whole other enchilada. We try to come up with new and innovative ways to draw attention to our labors of love. In the new millennium, we know that colors and sound work and we are thankful for You Tube. It allows us to find our favorite songs. The other day, I was observing an 8th grade Language Arts class. The teacher put the students in groups of four and gave them the lyrics to a song. She chose songs that had common themes with the book that the class was reading. Each group had to write their thoughts about the song on a large sheet and share it with the class. But when the teacher played the actual song on You Tube, the students lit up with excitement. It was a great way to end their school week. I later told her that I had recently tried the same technique when I pinned songs to excerpts from my books. She liked the fact that we were on the same page. In one instance, I wanted to use Willie Nelson’s touching version of ‘You Were Always on My Mind.’ I discovered that Elvis had sung it first and his version was quite impressive. I liked both, but stayed with Willie Nelson for my blog post. Sometimes, writers are consulted when their works are being made into a movie. Hollywood does take quite a few liberties with the authors’ works, but at least the story gets out there and reaches those who do not read. So, just in case Hollywood does come a-knocking, it would be a good idea to be prepared. When the director or producer asks, “What song would you use for this scene?” First, just pause and look as if you’re thinking. Then, lean over and go into your purse and take out this neatly folded sheet of paper (which has 50 songs on it). Calmly turn back around and say, “Well, let’s see.” And the conversation would begin as you pin those songs to those scenes! In Warm Intrigues, Phoenix has put her relationship with Tyre on hold after receiving some disconcerting news. She needs time to sort out things. After some time has passed, she finally calls him. Thirteen days had passed since the sharing of the letter. Phoenix had cried and sighed. The things that used to work to make her life tolerable were not working for her. She was bored easily. The movies, books, wine, or the overachieving at work did not fill the void. As one of her old friends used to say, “Once you have had the filet mignon, nobody wants dog food.” She used to laugh at her friend, but at this point in her life, the meaning was surreal. She thought that she could just walk away and just forget that she had met this man. But the flight plan was not working. Wherever she went, she heard his voice. She felt his touch. She saw into his eyes, and she could see the dimple revealing itself at the most unexpected times. She could no longer sedate herself by drinking. Phoenix had driven home from her mother’s that Sunday morning, and all of Septima’s words of wisdom were playing in her mind like a tape recorder. Her mother never told her what to do, but she helped her sort out her own thoughts. She allowed Phoenix to see herself in a transparent way and left her the room to make her own choices. Of course, this is what any good friend or mate can do. “Okay. Okay. I will do it!” she said looking up at the sky. “I will call him after midnight.” She called him. He picked up. “Hello, Phoenix-bird,” he said softly. “I saw your name on the caller ID.” Her heart skipped a beat upon hearing his voice. “Okay, I understand. Well, keep the ring as a token of my love,” he said. “No, no,” she said as she shook her head. “No, you don’t want the ring?” he asked. trying to say,” she bumbled. He was very quiet. All she heard was his breathing. “Tyre? Are you still there?” Phoenix asked. When the movie Waiting to Exhale came out, I remember this particular outspoken mother. She was on a talk show with her daughters and she said, “My daughters better breathe now!” They were discussing the movie which was originally a book written Terry McMillan. It basically dealt with women in challenging relationships. In essence, she was saying that she did not want her girls to hold on to pent-up emotions and consequently make themselves sick. They needed to exhale and breathe as they worked through whatever was happening in their lives. Sometimes, when we are traveling through challenges, we think that we are truly breathing. But in actuality, we are taking short, light- leveled breaths. Most spiritual gurus will tell us to take deep breaths. With a deep breath, we feel a lift of the shoulders and a squeeze of the lungs. A conscious deep breath gets that oxygen to the brain as we fill our lungs with fresh air. 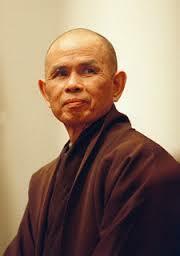 Thich Nhat Hanh writes that when we do conscious breathing, we get in touch with our gut-level feelings. If we pull out those feelings and honestly admit what is going on, we have a better chance of ultimately controlling our emotions. If something caused us pain, we should go ahead and say ‘ouch.’ We should let ourselves have a short time to sulk, cry, talk with a trusted friend, journal, walk or do whatever is necessary to get us to the next level. We should take ownership for how we really feel about incidents and events and know that it is okay to feel that way. Then, we have a better chance of returning to a healthy state which allows us to take deep breaths as we heal. According to the COPD Foundation website, deep breaths allow oxygen to flow in and carbon dioxide to go out. We pull fresh air into our lungs and we let go of the stale, trapped air. Whenever, we see someone in crisis mode, the first thing a wiser person will say is, “Breathe!” They do not want the person to have a panic attack or begin to hyperventilate. When we take deep breaths, we breathe from our diaphragm. The COPD website refers to it as abdominal or belly breathing. 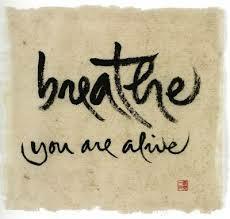 When we are conscious of how we are breathing, we can take deep breaths to help us relax and calm down. Physicians tell us to, “Take a deep breath,” during examininations. It allows them to see what is going on inside of us on a physical level. So, just think what a deep breath does for our emotional balance. Thich Nhat Hanh wrote one book called, ‘Breathe.You are Alive!’ He said, “To be able to let go is already to have arrived at liberation.” So, we must take deep, healthy breaths and know that it is going to be just fine. In this excerpt, Phoenix and Tyre are eating at a Japanese restaurant. They are enjoying themselves as they get to know each other. They both, again, chose salads to keep the promise of increased health. She chose fried rice and shrimp as her one side. He chose chicken and beef as his two sides and the chef heaved their helpings on to their plates after he cooked the food for the entire table. They talked as they watched the chef cook up the ingredients of the meals and somehow remembered exactly what each person had ordered. The servings were plentiful. Phoenix and Tyre laughed and talked about light things such as the latest on their jobs, what they were reading, and whatever personal projects they were engaged in. She shared that she was reading a book by Susan Wiggs. She told him that she had to keep something truly adult around to have an outlet after reading so much young adult literature for the job. Tyre shared that he also took delight in reading things that are not work-related. He subscribed to a few magazines for leisure reading. He also shared that he had recently started taking a course called Spanish for Educators. “Was that required?” she asked. “No. I just want to be able to communicate with all of my students, and the Spanish—speaking community is one of the fastest growing populations of the country, you know,” he said. “Yes. Being bilingual makes you highly marketable,” she said. As the conversation flourished, once again, time seemed to fly to both of them. At one point, Tyre excused himself as he went to the men’s room. Phoenix noticed that when he left, it was as if the air had left the room and her breathing became more constricted. She spent that time to take notice of the lovely Japanese art that hung on the walls to stay occupied while he was gone. “Nah. You wouldn’t understand,” she responded. “I will. At another time. In another location,” she said. “Does that mean that I will get another chance to see you?” he asked. He beamed. That one dimple appeared as he paid for their meal. “I plan to,” he responded. *Click on the arrow to hear Faith Hill’s song, ‘Breathe.’ Phoenix and Tyre are finally able to relax and breathe a little easier after many hardships. In A Golden Leaf in Time Revised, Phoenix is fed up with the shabby treatment she has been receiving at her place of employment. She has requested assistance from the library administration and finds out that she is being transferred to another library branch. She takes a walk to air out her feelings of disappointment. Phoenix wanted to make a good impression and certainly did not want her guests to see what was really going on at the library. She boldly went into the library, and when she spoke, the two sitting at the desk said nothing. “Okay,” she said inaudibly. This along with the fact that Angel was in her parking spot let her know the tone of the day. Envy is hostility, the withholding of friendship, hate stares, snubs, ridicule, cattiness, whispering, troublemaking, calumny, sulking, silence, acting injured, as if someone actually did something to hurt you. It’s uncalled-for temper tantrums, like slamming things down, walking very fast with heels banging on the floor (very common, like the woman who huffs and puffs . . . It was so perfect for what she was experiencing, so she wrote it down verbatim and taped it to the leaflet on her desk. It seemed to be the right thing to do to express what she lived through on a daily basis. She also felt that it might help future staffs cope. The library opened, and several of her favorite patrons came in to chat briefly. It was as if they could feel that something was happening. But then, she knew they knew. The community always knows. Shortly after those chats, a chief library administrator from the central office walked in, asked to speak with Phoenix, and informed her that she was being transferred immediately to another branch. He said that she would be on a new six-month probationary period and told her where she would be reporting. It all happened so fast that Phoenix informed the head librarian that she wanted to take a walk around the community. She left the library and started walking through the impoverished yet sainted neighborhood. She cried as she looked at the community children outside playing, who so sorely needed love and guidance. She walked on as the tears flowed, and instinctively, she ended up at one of the local elementary schools. She headed toward the school library and the school librarian in the hallway. They had worked together in the past. She took one look at Phoenix and knew that a disaster had taken place. The school librarian took Phoenix aside and kept reminding her that it was for the best. After Phoenix calmed down, she could hear the children singing from the music room. They were singing “You’ll Never Walk Alone.” It gave her the strength to leave the school and return to the library. On this MLK day, we think of service. Dr. King said, “Everybody can be great…because anybody can serve.” How can we be of service? The President often speaks of being of service and so we pause and ask ourselves how we can be of service to others? There is always a place that can use our ample hands, willing hearts and expertise in some area. There are so many ways to be of service. When we think of a loved one who is feeling under the weather, we can give them a cheery phone call. We can talk about light and humorous things to help take their minds off of what is bothering them. For a brief time, they can laugh and not think about their bodies or what ails them. Speaking and acknowledging another person’s presence is a form of service. We all know how a snub makes us feel; so a mere ‘hello’ costs us absolutely nothing. Sharing a smile can light up someone’s day. We never know what feelings others may be harboring. This lets the other person know that they matter and this too is a form of service. Helping an elderly person carry his or her groceries up some stairs is another form of service. Or, we could knock on an elderly neighbor’s door to see if they are okay and make sure that they have everything that they need. We could clean the snow off of the elderly or ill neighbor’s car after cleaning off our own car. We are outside anyway. Or, if we are going to the grocery store, we could see if they need any basic necessities to make it until they go on their major shopping spree. It is the small acts of kindness that truly equate service. It may be something as simple as pulling up a little closer to the vehicle in front while parking on the street, to make sure the driver behind can get out with a level of ease. We could offer to watch a neighbor’s toddler, while he or she cleans the snow off of the vehicle. Simply holding the door for the person that is behind us is a form of service. We all have a peripheral vision and can usually see, hear or sense when someone is in close proximity. The other day, I was looking for blog topic ideas. I visited Molly Greene’s website and she had a post called 101 Fabulous Blog Topic Ideas. She suggested that we add a song playlist for parts or all of a book. I thought I would try it for one ongoing emotion. Trey looks back with regret. In my novella, A Golden Leaf in Time Revised, Trey is involved in a stressful relationship with Flora. She is an insecure woman who constantly accuses him of being with other women. From the looks of things, he will be with her for a while because she is now with child. “ She (Flora) was far from his college girlfriend who challenged him on many levels—she let it be known that she was neither his servant nor cook, and they usually ate out, played chess or Scrabble, and there was a lot of mental sparing. “Again, taking folks for granted,” he heard himself say. Now he really missed her. “No, Flora,” he said flatly. “But I heard you say something,” she continued. “A huge tractor-trailer blew at him, and he swerved back into his lane, realizing that he needed to focus on driving and on his own grim situation with Flora. But the present seemed too difficult to face, so he reflected on the days with his former girlfriend for a while. He had let her slip away and had heard that she had married well to a stand-up guy. She had called him before her wedding and expressed her condolences in regard to his mother. She also told him that she’d always have a special place in her heart for him. She said that she realized that their lives had to take different paths and that she asked for his blessings for her upcoming marriage. During the conversation, he basically listened and said little. Afterward, he went to what was then a local pub and drank too much. He later heard through the grapevine that she was doing fine and had given birth to a beautiful little girl. *Click here and enjoy Willie Nelson as he pines for someone he once knew. To Cheryl: Remnants of a Dreamcatcher! This blog is dedicated to my oldest sister, Cheryl who recently passed. I am certain that she is with my parents and other loved ones who have gone on. I gathered a few items that she had given me from around the house and then took the picture below. I could feel her close by as I wrote. I keep seeing her smiling. How comforting! She is happy and out of pain. She looks like her old self again. She was beautiful and quite a looker! She was a true big sister who lined up her three younger sisters when we went to a new school. She’d say, “You see these three. If you bother them then, you have bothered me.” She probably had her hand on her hip with a sassy attitude! Anyone would think twice. She was a seamstress. She designed without a pattern. I remember a cranberry wool jacket that she had made and given to me. It had large drop sleeves and was lined with a rich black satin. Whenever I wore the coat, people wanted to know where I got it and how they could get one. “Will she make me one?” was the most prevalent question. She was a limo driver. Once, Annie Lee, a famous African-American painter, who also recently passed, saw her in the limo line-up in California. Annie Lee exclaimed, “There is an African-American woman driving that limo! I need to paint that!” She told Cheryl how she had reacted and vowed to paint it. I don’t know if she ever did, but she was surely impressed by my sister’s courage as she drove a stretch. I rode in it with her on a couple of occasions. She went to pick up a businessman and we crossed the Golden Gate Bridge together. I remember her telling me to be very quiet as she maneuvered the limousine across the suspension bridge. During another event, she picked up a birthday girl and her friends and I waited with her until they were ready for their pickup to go home. I always traveled to wherever she was living. So through her, I saw Los Angeles, when her daughter was born. I saw San Francisco and Oakland a couple of times and sat on Lake Merritt while visiting her. And, I finally made it to Florida twice and I visited her in Tampa and West Palm Beach. I remember us eating and walking as we browsed at an art fair in Boynton Beach. We saw both the Pacific Ocean and Atlantic Ocean together. I remember seeing the seals gathered on the rocks on the Pacific in California and I saw a scenic ocean liner on the horizon as we faced the Atlantic Ocean in Florida. So, the picture here represents remnants of her favorite things. The black taffeta was purchased from Fishman’s, one of Chicago’s high-end fabric stores. She spent many days and hours in fabric stores looking in pattern books and making selections of material. The navy blue bracelet is a gift for one of my birthdays. She made the African headband to the left and designed the colorful tam to the right. All of the sisters have one and we call them our crowns. 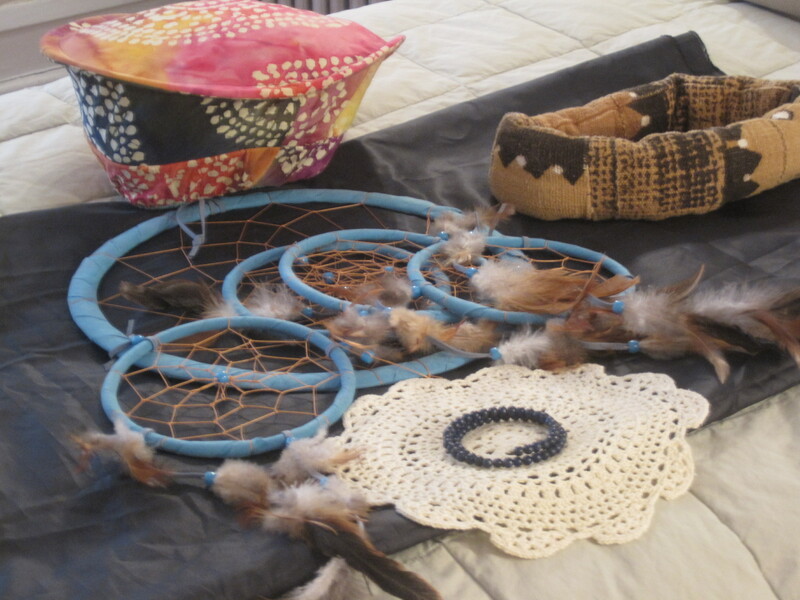 And then there is the huge dreamcatcher that she sent me in hopes of it capturing those bad dreams. This is only a small peek as I begin to reflect on Cheryl and how she touched my life. We had a special bond. We could talk. She knew how to listen and respond in a way that let me know that she had heard me. That is a gift in itself. Many hear but few really listen. I will miss her but I know that she is at peace and if I am really quiet, I know that I can hear her whispering words of encouragement as I carry on stronger for having known her.